I've been working on these a bit more. 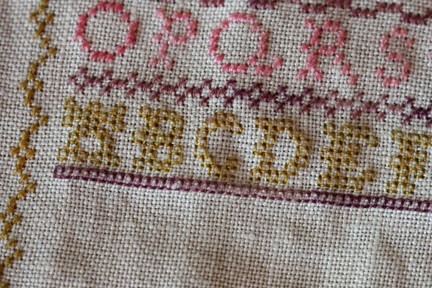 It's amazing how quickly the border and alphabet stitch up. 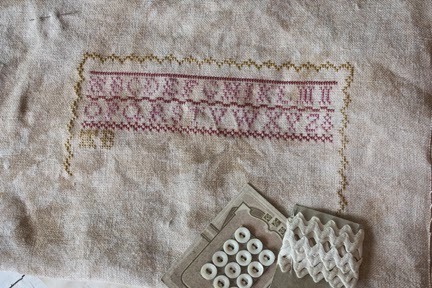 The one pictured above is the sampler using a 28ct. fabric and silk floss. I found that one thread of the silk floss covers very nicely. The four sided stitch is just too clumsy with 2 strands of floss. The instagram site has pictures now of your samplers. I listed the site wrong on an earlier posting. I found out you can't use punctuation. So use #BBDhersampler1796. Actually #bbdhersampler works just fine too. I'm finding that instagram is kind of easy and fun. Who knew? Well....really....quite a few of you already knew. I'm just discovering how fun and quick it is to see everyone's progress. 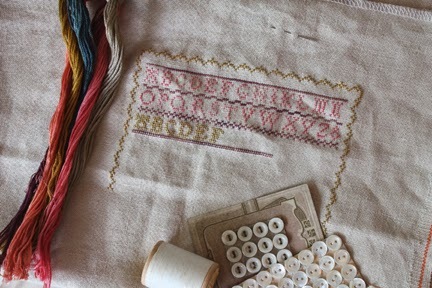 Above is the sampler using cotton floss. I worked on this a bit over the weekend.....but you can tell the four sided stitch has slowed me down. Below is a close up of the stitch. It really isn't as hard as I thought it would be. I am trying to use the "sewing method" and I just don't have the rhythm down right yet. But I'm sure I'll get the hang of it just when I'm done. Hope you are getting ready to start! It's amazing how much you can get done in an hour! Don't forget to show us your progress. The pattern was posted here on the blog. Check a couple of postings ago and you will find the link. Lovely start, Alma! I plan on starting this evening and will post updates to Instagram. I am an Instragram newbie too so I hope my pics are linking up. Is there somewhere besides instagram where we can see progress pictures? I don't have access to instagram. I can paste them up on the blog. 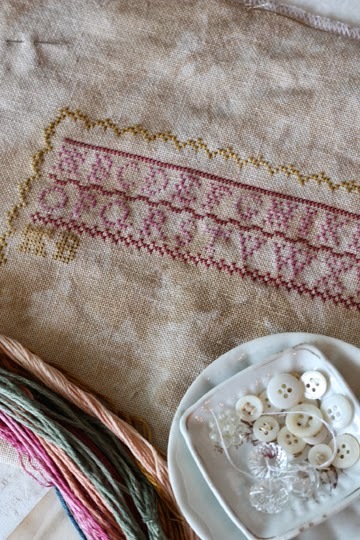 Beautiful combination of colors, strange "sewing method" but the result is special! I am so thrilled you are using Instagram for this SAL...I love Instagram!! I have not yet begun but I have this all kitted up. Lovely!!! I chickened out, and haven't even bought supplies. There is supposed to be a lovely cross stitch store that just opened in San Antonio. Maybe I'll cruise into town one day and see what they have. Otherwise...could I get by with Hobby Lobby? THanks, Alma! It looks great - I am not as far along as you though! Any chance of a four sided stitch tutorial? I have never done this stitch and am a little rusty in general with my cross stitch. Not sure what you mean by the "sewing method". Having fun though - it is a great change of pace from quilting for me! Interesting there is no "J" in any of the alphabets . . . do you know why . . . Fantastic post.This is the best post on this topic. I was very pleased to find this site.I wanted to say thank you for this great read!Thank you for sharing.